Surrounded by all the wonders of the Walt Disney World Resort, the Walt Disney World Swan offers a truly magical experience. Visit the Magic Kingdom Park, Epcot , and other amazing theme parks and attractions with the greatest of ease. 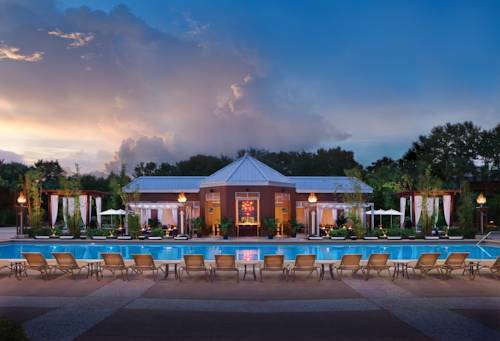 Our hotel offers a truly magical experience in the heart of the Walt Disney World Resort. Take advantage of special Disney benefits, including Extra Magic Hours in theme parks, FastPass+, complimentary transportation, and on-site character dining. Featuring the unique, contemporary designs of world-famous architect Michael Graves and Westin's signature Heavenly Bed, our 756 rooms and suites offer a tranquil retreat at the end of an adventure-packed day. Todd English's bluezoo: Enjoy coastal cuisine from Celebrity Chef Todd English, incorporating an innovative selection of fresh seafood in an energetic and vibrant atmosphere. Kimonos: An authentic Japanese sushi restaurant, the award-winning Kimonos restaurant offers fresh, artfully created sushi and other Japanese delicacies, an elegant, intimate atmosphere, and late-night karaoke fun. Open for dinner, reservations accepted. Il Mulino New York Trattoria and Lounge: One of New York City's most acclaimed Italian restaurants has come to Florida. Chefs and founders Fernando and Gino Masci bring the fresh, wholesome bounty of their authentic Italian cuisine in this dynamic rustic trattoria. Garden Grove: With its cheerful Central Park theme and Disney character dining every night and at weekend breakfasts, Garden Grove is perfect for family dining. Enjoy breakfast and dinner buffets and casual la carte favorites at lunchtime. Picabu: A curious gallery of evocative art and America's favorite foods. Self-service dining and sundries, 24 hours a day. The Fountain: Sit down in our malt shop and enjoy irresistible homemade ice cream, juicy burgers and golden fries. Open for lunch and dinner. Fresh Mediterranean Market: Savor fresh, made-to-order menu items from our Mediterranean-style market. Open for breakfast and lunch. Shula's Steak House and Lounge: Shula's serves only the biggest and the best, including Premium Black Angus Beef , the freshest seafood, and 3-5 lb. live Maine lobsters. Fuel: Stock up on grab-and-go options at Fuel, a convenient way to stay energized throughout the day. Choose from sanwiches, snacks, and coffee drinks made by our baristas. Satisfy your sweet tooh at our D.I.Y. yogurt stand or with a decadent pastry. Phins: Beneath a spectacular custom crystal chandelier, Phins is a contemporary loung in our newly transformed lobby's sophisticated ambience. Network with collegues in its expanded seating options, or unwind after a long day of meetings or adventures. Cabana Bar & Beach Club: Sleek and contemporary with a hint of South Beach style, this is the perfect place for lunch or dinner. Then transition into evening with cocktails at the iluminated bar. Open seasonally. Java Bar: Relax with an espresso, cappuccino or other coffee drink, conveniently in the resort lobby. Java Bar also serves an assortment of refreshing beverages and freshly prepared pastries.